Hi everyone, Sandee here with some fun and easy stencils to create with Helmar Foam Glue for your Gelli plate. 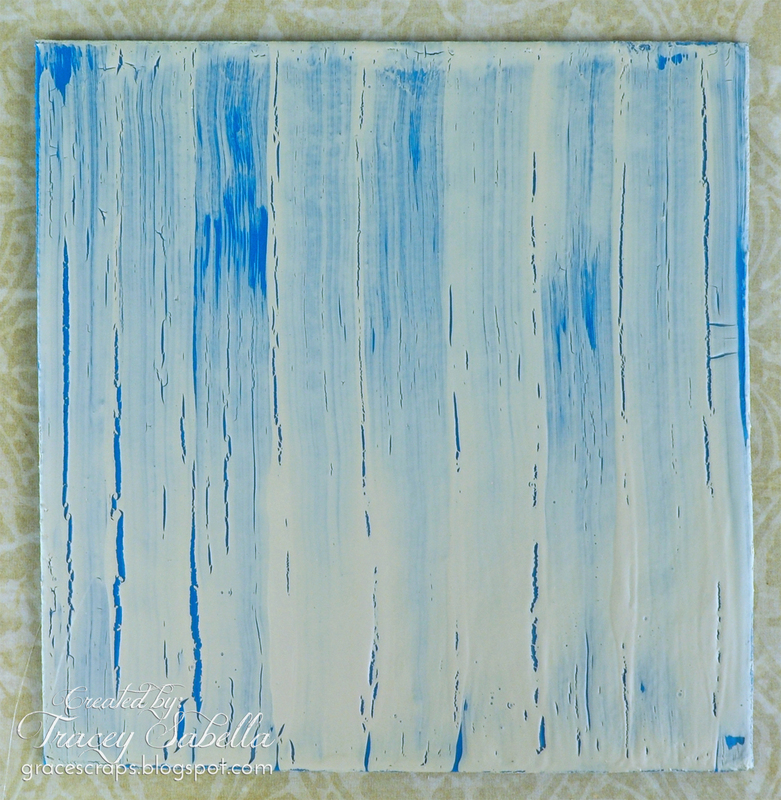 It seems to be the trend right now, to create organic stencil patterns for your Gelli plate by using a hot glue gun. Now this idea intrigued me, but not enough that I wanted to risk burned fingertips so I went to my glues and pulled out a flexible adhesive...Helmar Foam Glue. I then took out a sheet of Parchment paper and just went to town having fun making some random shapes. After the Helmar Foam Glue dries ( and it depends on how thick you make your lines ), simply peel it off from the parchment paper. I get my paper from my local grocery store. I made several designs, I must admit, it's as addicting as the Gelli printing process. Your kids would have a ball doing this and wouldn't it be fun to have them draw a stencil to use? I found that thinner lines make a prettier print. In this one I made the lines of Helmar Foam glue thick and didn't get as good of an impression. The glue really holds it shape well and they are a lot of fun to create without any burnt body parts, always a plus, right? If you want another Gelli printing trick using Helmar Decopauge and Craft Paste, then please check out my blog. My new phase in crafting is drop cloth canvas. You know the canvas drop clothes that can be picked up at the local hardware store that are used to cover the floor when painting? It makes a great (and very inexpensive) way to cover and remake items for a shabby chic look. I started first making a slip cover for one of my chairs in the living room. I've now moved on to recovering some throw pillows I picked up at the thrift store. I first washed both my drop cloth and the pillows before starting my project. I started by making an envelope covering for the pillow. I decided to go with a large flower motif on the front and cut a couple of petals from cardstock to use as a pattern. I traced and cut out eight large and six small. I want the edges to have a worn look, but don't want them to fray completely over time so I did a little sewing around the edges of each petal with my sewing machine. No more sewing now I promise ;) I took Helmar Fabric Glue and placed a little line of glue down the bottom center of each petal and pinched together. All my petals are finished and I started gluing them to my pillow top with Helmar Fabric Glue. Here is the pillow with all the petals glued in place. For the center I decided to cluster some colorful buttons that will match my bedroom decor - where this pillow will eventually find it's home. I started with a few of the larger buttons and placed them on the pillow with Helmar Craft Glue. I kept adding buttons until I was happy. Here is my finished pillow. I'm very happy with the outcome and because of the Helmar Fabric and Craft Glue the embellishing was finished in no time at all and is completely washable. Hmm. . . now how will I finish those other couple of pillows . . . Thanks so much for stopping by the blog today. If you want to see any more ideas about creating with drop cloth material you can check out my pinterest board I started as well as drop by my blog. I'll be sharing more drop cloth projects as I get them finished. Thanks so much for stopping by everyone and I hope you enjoyed my post for today!! Have a love for minibooks or albums? I certainly do, and sometimes you just can't find a premade book with all the materials you love...that's when you have to create your own. There are many variations of styles and sizes that can be created, even down to the size. Here, I'll show you a basic 6X6 mini book I created. This book can be used for mixed media or a basic journal. To create this book, I first started with selected fabric, batting, chipboard cut to size including a spine. First adhere the chipboard to your batting using Silicone Adhesive Sealant to guarantee a strong bond. Trim excess batting from edges. Now to apply the decorative fabric I used Helmar Fabric Glue. Lay out your selected fabric (decorative side down), then lay your padded foundation down. Cut the fabric, leaving 1/2" on all sides to fold over the edge of the chipboard. Cut the corners of your fabric as shown above. This will give you a flat edge fold on each corner of the book. This is how your book will look after the fabric covering is complete. Now it's time to decorate the cover. To add dimension to this little wooden birdie, I"m using Helmars Scrap Dots. Finally add your pages either by stitching, binding or adding rings. You have just created your own personal mini album to create in however you choose. 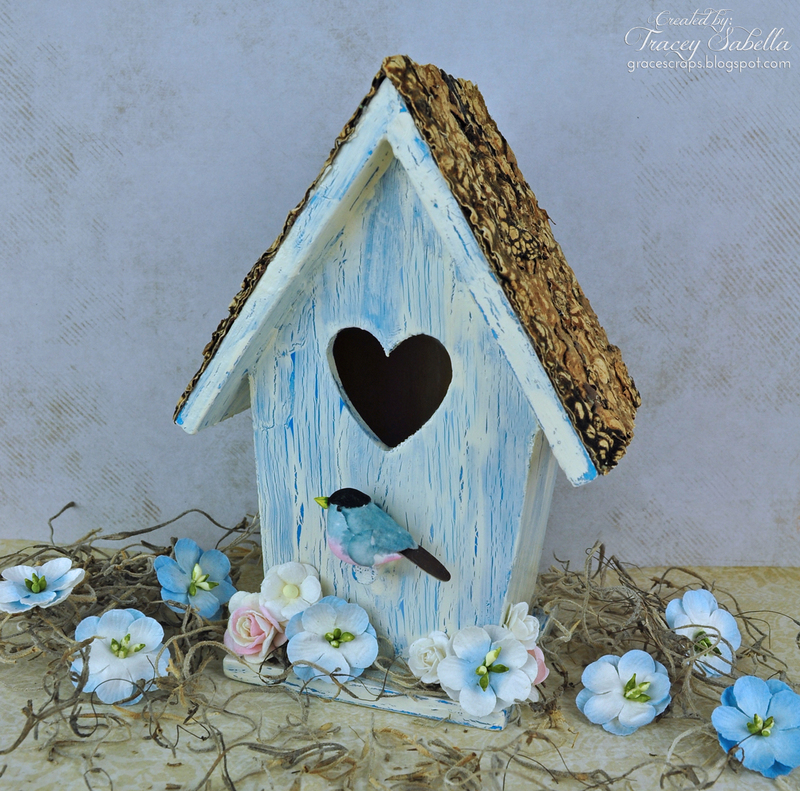 Hi, it's Tracey here to share a shabby bird house I decorated featuring a crackle paint technique using Helmar Craft & Hobby PVA Glue. You might be surprised that I haven't used paper on this project! I've gone back to my roots as a crafter. I've been wanting to try this technique out for some time now and am delighted with the results. Of course this technique would work on chipboard or heavy weight paper as well. First I painted and crackled the house. Instructions are included below in my tutorial. Next, I adhered tree bark to the roof using Helmar 450 Quick dry Adhesive. I cut it a little larger than needed, then trimmed after it was adhered to the roof. The bark came on a roll in the floral department of our craft store. 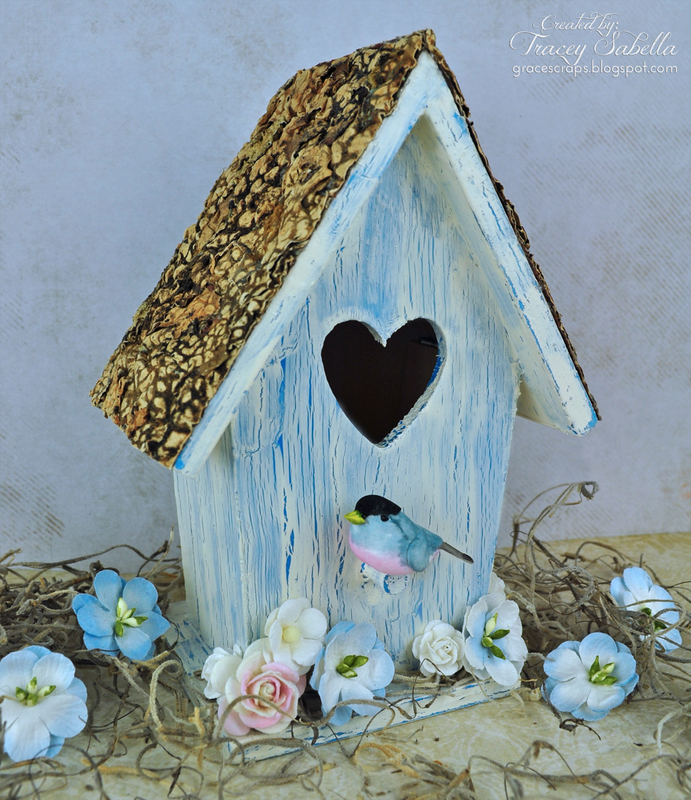 Finally, adhere Spanish moss and flowers around the base of the bird house, then a tiny bird on the perch using Helmar 450 Quick Dry Adhesive. Paint your object with a base color. I've cut pieces of chipboard to demonstrate. The chipboard only required one coat of paint to cover, but the wood bird house needed two coats to cover since it had not been primed. 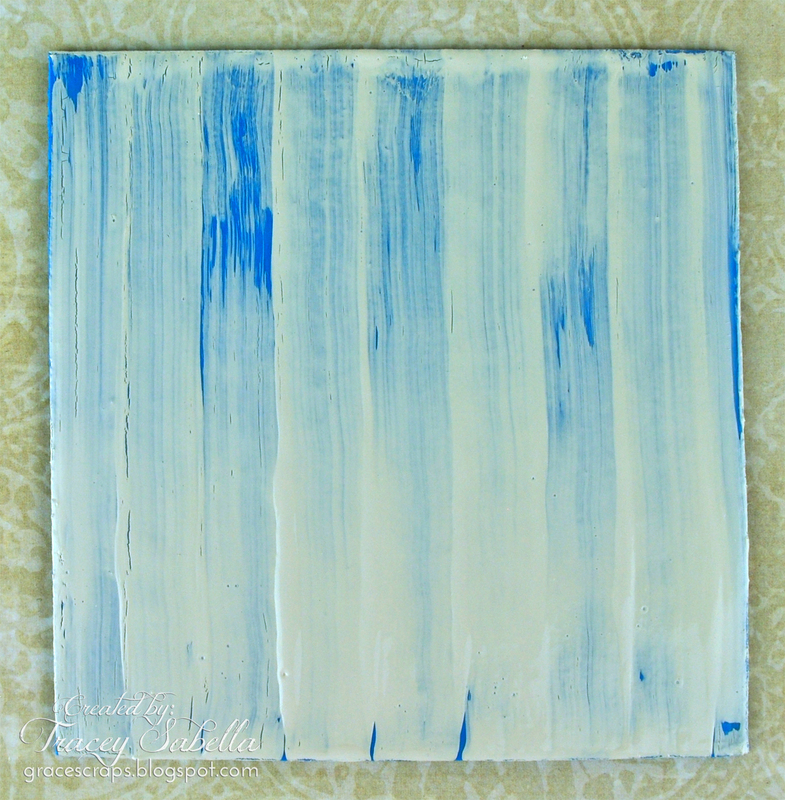 You can paint the base coat on the entire project before beginning the crackle process. Brush a medium layer of Helmar Craft & Hobby PVA Glue across the painted area. Work in small areas at a time. I worked with one wall of the bird house at a time, then went back and crackled the roof and base details a bit at a time. I kept all my brush strokes going in the same direction resulting in a linear crackle pattern. If you swirl on the glue, it would change the pattern of the top coat crackle. Allow the glue to dry a little. It should still be white, but should lose the shiny, wet look. You can let it sit about 8 to 10 minutes, or use your heat tool briefly. If using a heat tool, heat just until the glue loses it's shine. 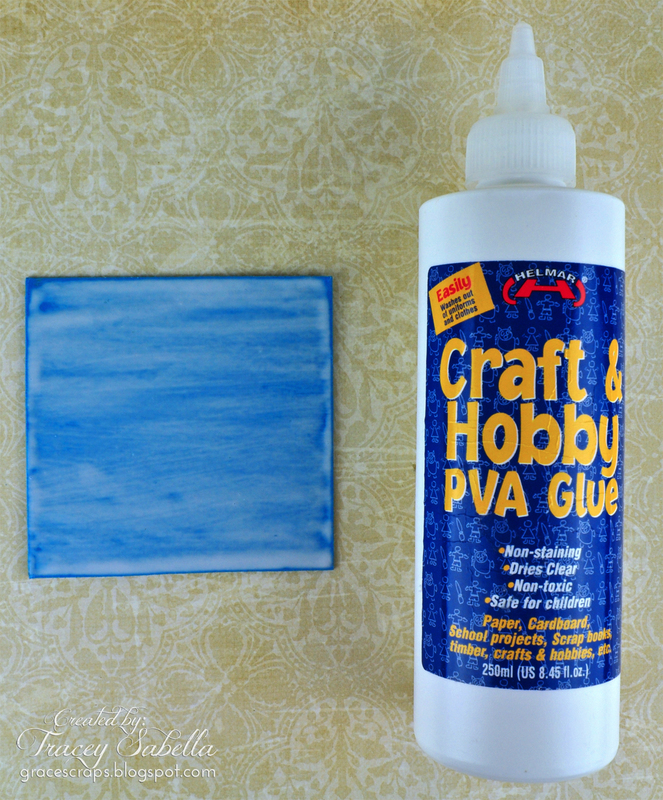 Brush a thin layer of contrasting color of paint across the tacky Helmar Craft & Hobby PVA Glue. Be careful not to brush over an area a second time as that portion will not crackle. It's OK if you don't get complete coverage as you are looking for a distressed crackled look. I brushed on the paint with strokes going in the same direction as the glue strokes. Allow to dry or speed up the drying process with a heat tool. The paint will crackle as it dries. If you use a heat tool, keep it moving and don't put too close to the surface as this will cause the paint to bubble. You can see where the paint is thinner, there is more of a crackle effect than where it went on thicker. 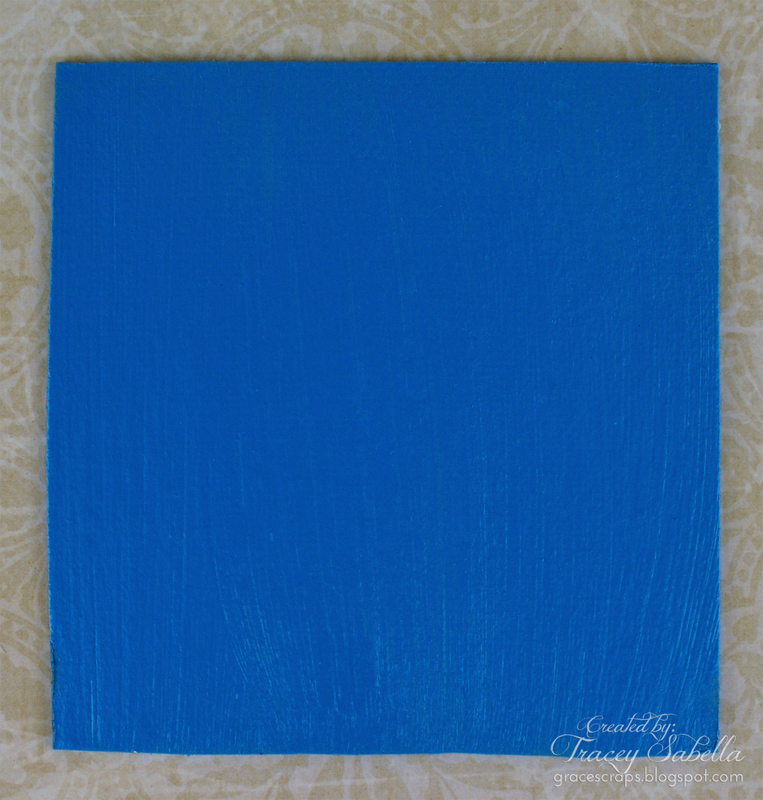 After the paint is completely dry and set, you can sand the edges lightly to further distress if desired. You could even paint projects like furniture with this technique if you finish with a coat or two of sealant. Here's one more view from another angle. Today I wanted to share a restyle project I did. At a concert I was at this summer, one of the vendors was giving away these free little notebooks. I loved how cute and small they were, but they had the vendors logo on the front, so I decided to revamp mine. I used my 450 Quick Dry Adhesive to glue down wooden letters on the front of my notebook, covering up the vendors logo. I'm a bit impatient when it comes to waiting on glue to dry, so that little bottle of 450 Quick Dry is one of my go-to glues! Once the glue was dry, I painted over my letters with an aqua blue acrylic paint. Then I used more of the AMAZING 450 Quick Dry Adhesive to glue a ribbon down to the notebook above my letters. We are looking for dedicated creative design team members who work well with deadlines and guidelines. Designer positions on the Helmar Design Team are for a 6 month term beginning October 1st, 2014. Please submit your application to khitchen@helmar.com.au by Friday 12th September 2014. I have a little pin cushion problem!!! I love them, I'm not sure why but they just really seam to appeal to me!! If I find something that looks like it could be a pin cushion then that is exactly what it will become as with this lovely little goblet I recently found at a thrift / op shop. Firstly cut yourself a piece of mesh/lace at least twice the diameter of the opening of the vessel, this can be cut in to a square or a circle. Sew a simple running stitch (moving your needle in and out at regular intervals) around the mesh/lace being sure to leave a long tail at the beginning and end. Pull the threads in gently and stuff the inside of the mesh/lace until you have the desired amount, do not overstuff or your pincushion will end up being too hard. Pull in the threads and tie them altogether. Trim threads. Using your Helmar 450 Quickdry Adhesive, run a bead all around the inside of your chosen vessel. Place your little cushion inside the vessel (gathered side down) and adjust it to fit properly and make it pleasing to the eye. Decorate the outside of the vessel with lace and attach any embellishments to the cusion using Helmar Fabric Glue. I love to give gifts to others and often times I don't have a cute gift bag on hand to do so. This is one of my favorite things to do! Whether it's for a teachers gift or for a neighbor that's recovering from surgery, a personalized cute gift bag is always on point. I followed this nifty video here and customized my bag for a quick Halloween goodie bag for a neighbor. Helmar 450 is one of the best adhesives that I've found to use for this project. Also add in some scrapdots or zapdots for amazing dimension for any project. Here's what mine looks completed, if you attempt making one of these please share with us! We would love to see what you create! Sandee here, waving hi from the hills of North Carolina! I don't know about you, but boy, summer is flying by for me, so much to do and so little time to do it all in! Time sure can fly by and all those little moments just disappear in the blink of an eye and I know that sometimes we don't have a lot of those "moments" to craft. I'm here to show you how to put together this lovely little journal in about 10 minutes! Super easy and super fun with Helmar Adhesives to help you along the way. After adhering the front cover with 7 Dots Studio paper with my Helmar Premium Craft Glue, I used my Helmar Tape Runner to decorate the binder of the journal with Ranger's Distress Glitter. First I ran the tape down the side of the journal and then generously spread the glitter over the top and gently shook off the excess. I do coat the glitter with my Helmar Crystal KOTE Gloss Varnish to seal in all that blingy goodness and it's amazing how quickly it dries! Next I affixed the butterfly with my Helmar Premium Craft Glue and the Want 2 Scrap pearls with my Helmar Gemstone Glue. All I had to do to finish it off was to add my words which I printed out on the computer and a Prima Lace sticker and color me done! Quick gift for a friend or even for yourself! I hope my project inspires you to take a few of those "moments" and dedicate some crafting time for yourself!